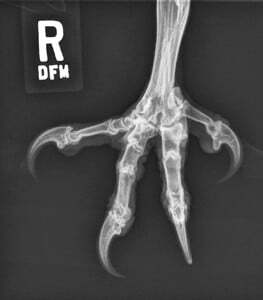 Avian radiography has unique challenges. 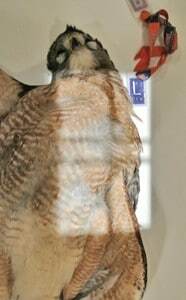 Learn avian specific techniques, positioning, collimation, and evaluation of image quality. Imaging Essentials provides comprehensive information on small animal radiography techniques, and the series has addressed the majority of anatomic areas in canine and feline patients, from the head and spine to the thorax and abdomen to the limbs and their joints. Access these articles through our online Article Library, available at tvpjournal.com. Radiography of the avian patient is an essential diagnostic tool that assists with evaluation of a variety of disorders. Appropriate patient positioning and radiographic technique are vital for proper radiographic assessment. Improper positioning and/or radiographic technique can underestimate or overestimate potential lesions. 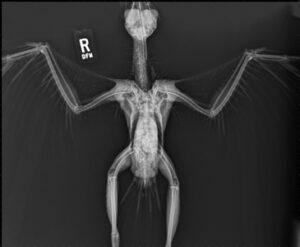 Due to the small size of many bird species, whole body projections that include the coelomic cavity, head, and pectoral and pelvic limbs are often obtained for screening purposes. This technique also minimizes time of radiographic examination. However, even in small patients, consider images centered on, and optimally positioned for, specific areas of concern for best diagnostic value. 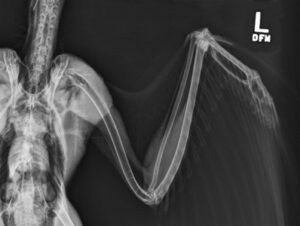 For larger avian species, separate radiographic projections are necessary in order to include the head and limbs. In contrast to small animal radiography, the entire coelomic cavity of birds is imaged together because there is no division between the thorax and abdominal components. Although basic positioning principles are similar, there will be some variation in technique depending on the avian species. For example, the pelvic limbs of ducks do not extend as far distally compared with other avian species. Additionally, ducks and some other waterfowl species have shorter wingspans than parrots and raptors. mAs: Use the lowest possible mAs to select the smallest focal spot, which results in improved geometric sharpness and best geometric detail. 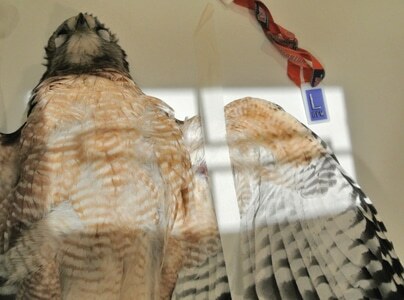 Tabletop versus grid: A tabletop technique is recommended for smaller avian species; however, when the anatomic area being imaged is > 10 cm, use of a grid is recommended. 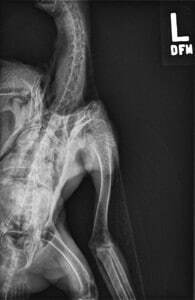 For example, when using a nongrid, digital radiography imaging system for an average size parrot, the mAs is 1.5 to 3, with a kVp between 55 and 65. Place the patient in dorsal recumbency, directly on the cassette for tabletop technique or directly on the table for film-tray technique. Tape each pelvic limb separately, at the level of the tarsometatarsus, and extend caudally (see Tape Protocols). With the distal extremities placed evenly, secure to the table or cassette. Extend the pectoral limbs laterally, and evenly secure to the table or cassette by placing tape at the level of the mid antebrachium. 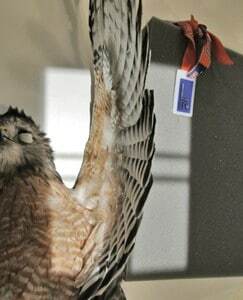 The piece of tape must be long enough to span the entire wing, including the feathers. Securing the pectoral and pelvic limbs in these positions aids in proper positioning of the coelomic cavity by helping align the keel while, at the same time, eliminating summation of the limbs with the coelom. Perform palpation of the keel. Make fine adjustments in positioning, if needed. With the patient in this position, an extended leg VD/craniocaudal projection of the pelvic limbs can be imaged separately, if desired. For the VD view of the coelom, the entire coelomic cavity is included within collimation, if possible. For smaller avian species, this projection may also include the skull, wings, and pelvic limbs. This commonly injured region (Figure 1B). The cardiac and hepatic silhouettes (when determining if these organs have altered in size). Figure 1. 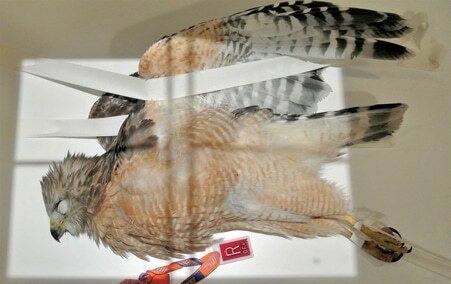 Red-shoulder hawk positioned for a VD projection of the coelomic cavity and pelvic limbs (A), and corresponding radiograph (B). Place the patient in right lateral recumbency—the most common position. In patients with trauma or pathology, place the affected side closest to the cassette. Extend the pectoral limb—closest to the cassette—dorsal to the coelom, above the spine. Place a piece of tape across the mid diaphysis of the antebrachium. 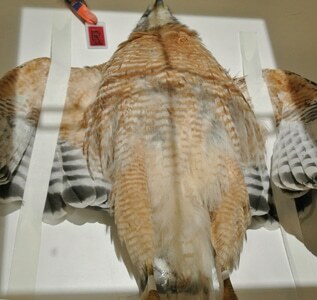 The piece of tape must be long enough to span the entire wing, including the feathers. Position the second pectoral limb in a similar manner—extended dorsal to the coelom—and secure individually with a second piece of tape that spans the antebrachium. Individually tape the pelvic limbs at the level of the tarsometatarsus, and evenly extend caudal to the coelom. The pelvic limbs can be positioned together or separately, with one cranial to the other. The latter technique allows evaluation of the pelvic limbs individually, but the cranially positioned limb is invariably superimposed over the caudal coelom, which may hamper coelomic evaluation. The lateral projection of the coelom includes the entire coelomic cavity. Clavicles are superimposed over each other. Figure 2. Bird positioned for a lateral projection of the coelomic cavity and pelvic limbs (A), and corresponding radiograph (B). Medical tape is used to assist in positioning the pectoral and pelvic limbs. Porous medical tape or masking tape is preferred over waterproof tape varieties because they are less damaging to the patient’s feathers and skin during removal. When taping the pectoral limbs, always place the tape at the level of the mid diaphysis of a bone and never at the level of a joint; tape placed at the joint level can result in long bone fractures if the patient begins struggling during the procedure. For the lateral projection, position the patient in a similar manner as described for the VD coelomic projection. Extend the wing laterally, with the primary feathers flush with the cassette. Secure the wing to the cassette using a piece of tape placed across the entire wing at the level of the mid antebrachium. 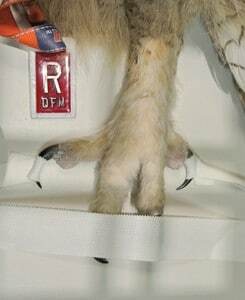 With the patient in dorsal recumbency, minimum positioning effort is required because this is a natural limb position, if the primary feathers are placed flush with the cassette. From this position, a lateral projection of the entire wing that includes both the brachium (humerus) and antebrachium can be obtained. For larger species, shift the coelom laterally to fully extend the wing across the cassette. 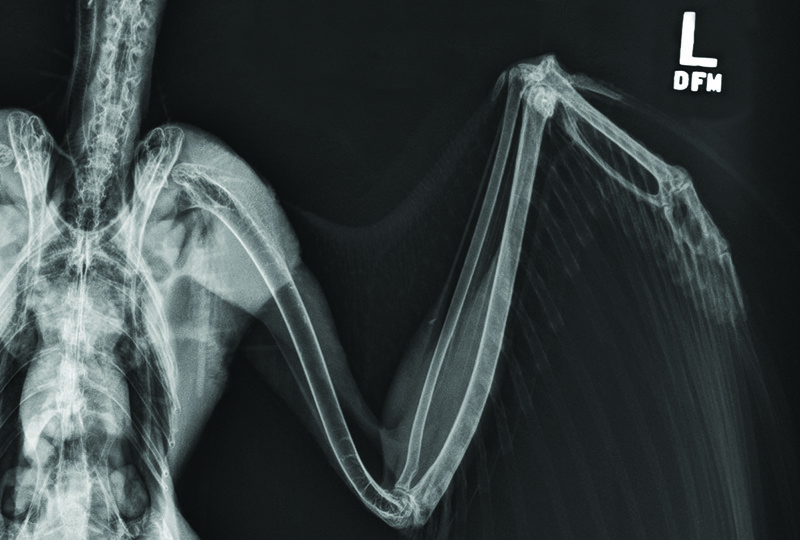 If the wing is too large to fit within the collimation, it may be necessary to obtain images of the proximal and distal portions of the pectoral limb. Make sure collimation for the lateral projection of the wing includes from the midline of the pectoral girdle to the distal aspect of the phalanx. Figure 3. Bird positioned for a lateral projection of the wing (A), and corresponding radiograph (B). Obtain the craniocaudal projection of the humerus with the patient positioned in dorsal recumbency, similar to patient positioning for the VD projection of the coelom. Place tape around the most distal primary feather of the distal extremity. Gently extend the limb ventrally, along the lateral body wall. Include the entire scapulohumeral joint distally to the proximal to mid antebrachium. In cases of severe trauma, fold the antebrachium across the lower half of the abdominal cavity and secure. This projection shows the entire humerus, with a small amount of superimposition of the radius and ulna over the elbow joint. Collimation for the craniocaudal projection of the humerus should include from the midline of the pectoral girdle to the proximal antebrachium, which ensures the entire scapulohumeral and elbow joints are included. In this projection, the humerus is elongated and the epicondyles of the distal humerus relatively symmetric. Due to the position of the distal wing, the radius and ulna will be foreshortened and oblique in this projection. Figure 4. Bird positioned with the wing extended ventrally along the coelom for a craniocaudal projection of the humerus (A), and corresponding radiograph (B). Position the patient in dorsal recumbency to obtain a caudocranial projection of the antebrachium. 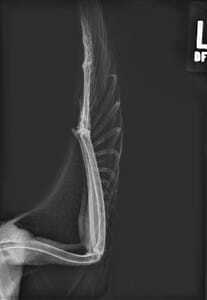 Similar to the craniocaudal projection of the humerus, place tape around the most distal primary feathers of the distal extremity. Gently extend the limb cranially, adjacent to the lateral aspect of the head. Collimation should include the elbow to the distal aspect of the digit. The caudocranial projection of the antebrachium includes the distal third of the humerus proximally, and the entire phalanx distally. Correct positioning results in the radius superimposed over the ulna, and the major metacarpal bone superimposed over the minor metacarpal bone. The humerus is foreshortened and oblique in this position. Figure 5. Bird positioned with the wing extended dorsally along the head for a caudocranial projection of the antebrachium (A), and corresponding radiograph (B). This projection evaluates elbow or distal extremity luxations as well as further evaluation of fracture displacement. Place the patient in lateral recumbency, with the affected limb placed directly on the cassette. Radiograph each foot individually to avoid magnification and distortion. To assist with positioning, place tape around the distal aspect of each digit. Extend the plantar digit (digit 1) plantarly, while extending the remaining digits dorsally. Separate all digits equally, with a gap present between each one in order to eliminate summation of the digits. Figure 6. 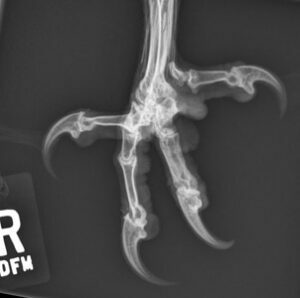 Bird positioned with the digits separated for a lateral projection of the digits (A), and corresponding radiograph (B). 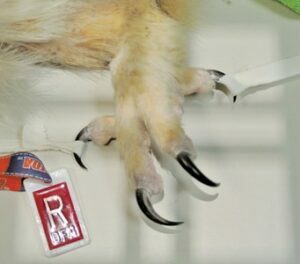 Most avian species (parrots, songbirds, and raptors) have 4 digits on each foot with digit 1 located on the plantar aspect on the foot. Place the patient in dorsal recumbency. Tape the plantar digit (digit 1) medially to prevent summation with the tarsometatarsus. Extend the remaining digits dorsally, spreading them equally and directly in line with the tarsometatarsus. The lateral and dorsoplantar projections of the digits show each digit separated, which allows each joint of the phalanx to be evaluated properly (Figures 6 and 7). In cases of contracture or fractures of this region, appropriate positioning may be difficult. In these cases, it may be necessary to create an oblique projection by rotating the limb in order to separate the affected digit(s) from the others. Figure 7. 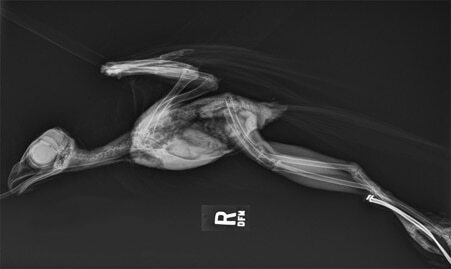 Bird positioned with the pelvic limbs extended and digits separated for a dorsoplantar projection (A), and corresponding radiograph (B). For quality control of any diagnostic image, use a simple 3-step approach. Is the technique adequate, with appropriate exposure and development/digital image processing algorithm factors? Is the correct anatomy present within the image? Compare the images you obtain with the images in this article. Is positioning anatomically correct? Was correct anatomic coverage obtained? Symmetry, especially for musculoskeletal structures, is a key component for proper evaluation as it assists the interpreter with the anatomic differences that can occur between different species. Farrow CS. Veterinary Diagnostic Imaging: Birds, Exotic Pets, and Wildlife, 1st ed. St. Louis: Elsevier Mosby, 2008. Pees M, Krautwald-Junghanns ME. Diagnostic Imaging of Exotic Pets: Birds, Small Mammals, Reptiles, 1st ed. Hannover, Netherlands: Schluetersche, 2010. Samour J, Naldo JL. Anatomical and Clinical Radiology of Birds of Prey: Including Interactive Advanced Anatomical Imaging. Philadelphia: Elsevier Saunders, 2007. Silverman S, Tell LA. Atlas of Normal Radiographic Anatomy of Avian and Exotic Pets. Philadelphia: Elsevier Saunders, 2010. D anielle Mauragis, CVT, is a radiology technician at University of Florida College of Veterinary Medicine where she teaches diagnostic imaging. She coauthored the Handbook of Radiographic Positioning for Veterinary Technicians and received the Florida Veterinary Medical Association’s 2011 Certified Veterinary Technician of the Year Award. Daniel VanderHart, DVM, Diplomate ACVR, is a practicing radiologist in Cleveland, Ohio. He received his DVM from Michigan State University, completed a rotating small animal internship at University of Georgia, and worked as a small animal general practitioner. He then completed his radiology residency at University of Florida and served as a clinical assistant professor in diagnostic imaging following his residency.